I love the colors-----this a great card. So pretty!! Lovin all these butterflies! I love your card, Trish! Thanks so much for joining in on my birthday hop! The colors on this card are gorgeous! Very pretty! Love the butterflies and colours, TFS! way too pretty! thanks for reminding me about all my SU stamps gathering dust! This is so pretty I love the colors! Love the colors. Great card. I love this...it is beautiful....WHat is the color coach you mentioned? Love your card, very pretty! TFS! Gorgeous card Trish!! Love it! Happy to be a new follower. I love your card. I need to know what size you made it? It's fabulous! Beautiful card! The colors and perfect. I'm now a follower. Love this! VEry Graphic Design look! Beautiful card!! Love all the colors that you used! New follower and looking forward to seeing your creations! Thanks for sharing! Beautiful card!! Awesome color combo! Love it!!! Love your card and the beautiful papers that you used. The butterflies are really pretty! The card is gorgeous! I love the butterflies. Very pretty card. I love the colors that you used. Love your bf card...very pretty. Very,Very Pretty!! Love the colors!! TFS!!! I have been a follower of your super Blog!! LOve this little card...its so pretty!!! 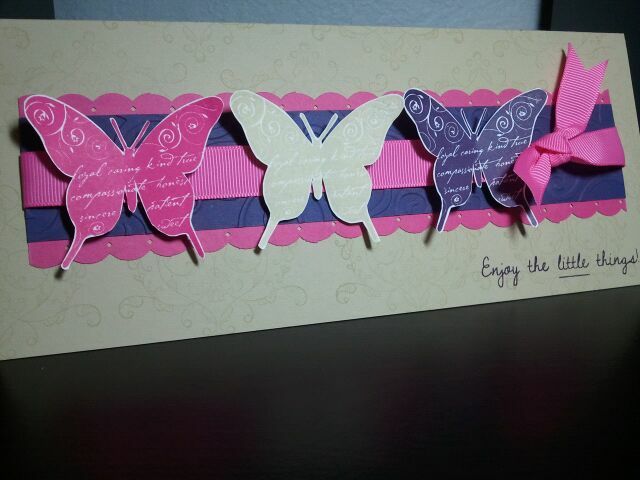 I love the colors and the background stamp on the butterflies is soooo elegant....GREAT job!!! What a beautiful card. I love the color combo. Thanks for sharing!! Beautiful color combo! Love the butterflies, TFS! Love your color scheme. Pretty card. This is really a simple & gorgeous card.... love the colors! Thanks so much for shairng!!! 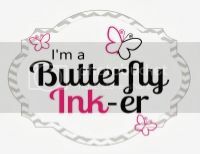 Love the butterflies, I want to get the stamps and punch from stampin up they are awesome. After seeing yours I really want them. This is beautiful, I love the papers you used! Love the script on the butterflies. Looks good. That card is amazing...the colors, the butterfly's and the techniques are perfect! Trish-Love your card and your name....LOL. So simple but yet so pretty!